This month was really good with less than $3K in expenses!!! $1,024 of that was for an emergency replacement of our front jacks so we really only spent $2,318 for the month, which is right up there with one of our best financial months ever. Part of that is that we are working so hard we haven’t done much of anything, and the other part is the things we have done were mostly free. As always for more details please see below. Groceries – We went over again by over $200. Going to local more expensive grocery stores, buying lots of pre-made food instead of cooking meals because of our schedule, and another Costco run are the culprit. On the other hand, we should be able to keep July much lower because now we’re pretty well stocked up. We’ll see. Pie is expensive. Truck Fuel – This was really low because we aren’t really going anywhere. Lee runs into town on our days off, but we haven’t taken any trips. Again, good numbers because of crazy work schedule. New Equipment – We had a catastrophic failure of our front jacks/landing gear (Lee is writing about it in the next post) and because our rig had to stay hitched with the nose down over 4° while we waited for the replacement jacks, Lee paid $200 for next day shipping, otherwise we would have been tilted down that far for a week or more instead of just two days. 4° is a lot of forward tilt to live with. These things happen, but it was a bummer, because we really wanted to put that money back into our bank account. But at least now we have brand new front jacks. So, how do you hardly spend any money? Work long 10+ hour days, 5-6 days a week, and don’t go anywhere! Just like we dreamed! Seriously, though, it’s beautiful here, the weather is spectacular, and we were lucky enough to have friends come and visit us, so we don’t feel like the month was a total waste, but it would be nice to have the time and energy to do more with our free time. Maybe it will start to get a little better after the middle of the season. Even if it doesn’t, by the time we get to the end of the season we will have been able to set aside enough to take a nice 4-6 week break before we start gate guarding for the winter. That’s progress over previous years for sure! This entry was posted in Lakeside and tagged Fulltime RV Budget. Bookmark the permalink. That was a phenomenal month. Congratulations! Front jack malfunctions are definitely a problem. Due to some inexperience on my part, our fronts were down about half a level bubble. I realized that not only is that uncomfortable, I think it affects how the tanks drain. Even though you’re working alot, the environment is hard to complain about. Lee I sent a message and have resent it to yall’s number. Can you look for it plz. It would have come from 2523416779. Thanks and keep up the good work. We waiting for the salmon to pick up. Its been awful. Everyone says there business is down 30%. Caught two halibut 14 lbs. of fillets. Later on. Are you going to work Amazon this year? How about the sugar beets? Where are you guys going after Oregon? No amazon and no beets. Probably going to gate guard again and hopefully take some time off in between. 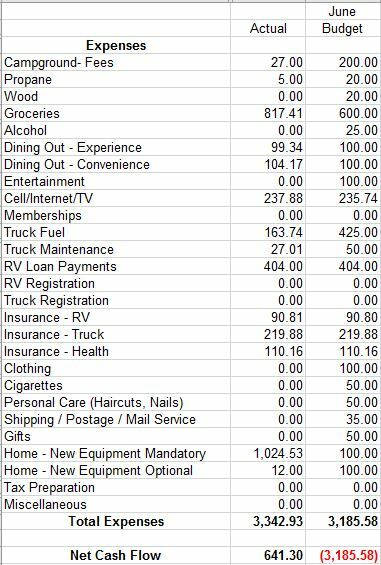 Always been curious what a monthly budget for an RV lifestyle would look like and I thank you for an excellent example. All my best to you.